Last month we tasted the first of this new portfolio, the Craigellachie 13 year old and tonight we will be tasting another three. The next three are a 17 year old, a 19 Year Old (this is for travel retail only) and a 23 Year Old. Craigellachie have stubbornly stuck to tradition, a hallmark of the distillery, hence the continued use of old-fashioned worm tubs to cool the new spirit. These help to bestow extra flavour and create a meaty character to rival Whiskies of a greater age. Famously sulphury and challenging in style, these are drams for daring palates. The first one up tonight is the 17 Year Old. 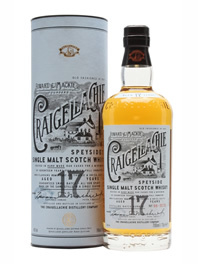 Craigellachie – 17 Year Old Speyside Single Malt Whisky, Un Chill-filtered, 46% Alc/vol. Nose…Pine wood, vanilla, mixed berries, marshmallows, hint of an extinguished match, banana bread, a rhubarb tartness. Palate…Lavender, vanilla fondant, earthy, basil custard, a wee ginger nip. Nicola opens the next bottle, the 19 Year Old. 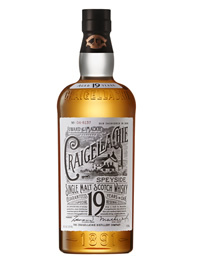 Craigellachie – 19 Year Old Speyside Single Malt Whisky, Un Chill-filtered, 46% Alc/vol. Nose…Stewed apples and nutmeg, sulphur hit, Caribbean soft fruit. Taste…Hot and sulphury, ginger snap biscuits, spicy apple strudel. Finish…Medium finish with a sulphur fizz. I now open the last bottle the 23 Year Old. 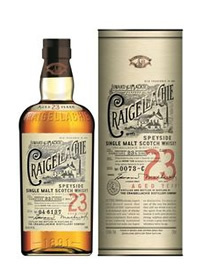 Craigellachie – 23 Year Old Speyside Single Malt Whisky, Un Chill-filtered, 46% Alc/vol. Nose…Hint of the mash tun, biscuits, mellow, onions, pine nuts, balsamic reduction. Taste…Walnuts, ginger root, sulphur, linseed oil soaked artists brushes, minty, crushed cinnamon stick. Finish…Long and warming, drying like chilled tonic water. That is three very different drams, Nicola and I loved the 17 and the 23 Year Olds, but, the 19 Year Old that’s another story. We both felt that the 19 Year Old was not part of the Craigellachie family, (the black sheep). So the 19 Year Old was not for us. We are looking forward to the release of the 31 Year Old later this year or early next.